This book is a practical discussion of six actionable steps that students can take to land a job regardless of the market. 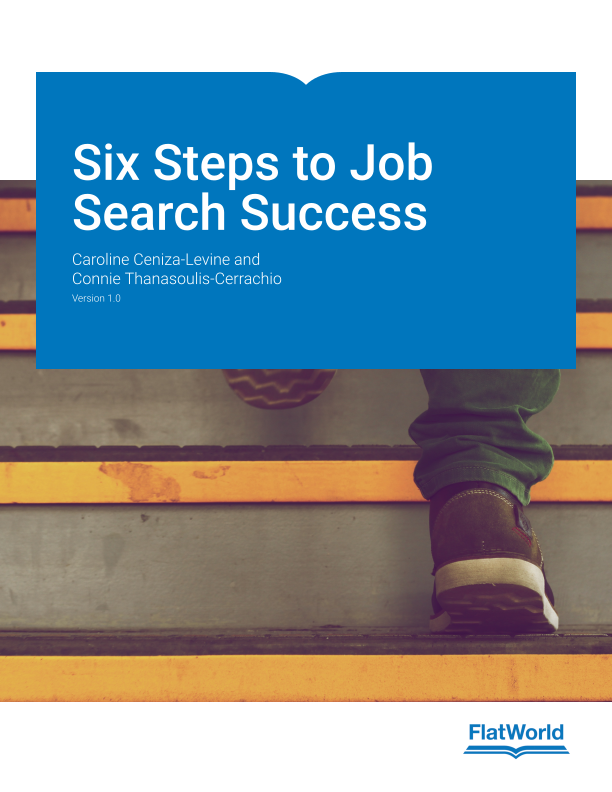 The authors encourage students to be proactive and explain that, in reality, the ability to apply and land a job is a distinct skill in itself. The six steps are: identifying your target, creating a powerful marketing campaign, researching, networking and interviewing, staying motivated, and negotiating and closing the offer. 6.1 What Do You Research? 6.2 How Do You Find The Critical Information? Caroline Ceniza-Levine, career coach, writer, speaker, multi-generational workplace expert and co-founder of SixFigureStart®, has 16 years of experience in professional services as a management consultant and executive and corporate recruiter. She has recruited for leading companies in media, financial services, management consulting, pharmaceuticals and technology. Caroline is a career columnist for CNBC.com, Vault.com, Wetfeet.com, and Forbes.com and an adjunct assistant professor of Professional Development at Columbia University School of International and Public Affairs. Caroline is a co-author (along with Jack Canfield and others) of the best-selling How the Fierce Handle Fear: Secrets to Succeeding in Challenging Times, Two Harbors Press. Her career advice and job market insights have been extensively quoted including mentions in NBC News.com, CBS Moneywatch, BusinessWeek, CareerBuilder, Christian Science Monitor, Newsweek, Real Simple, NPR and The Associated Press. Caroline is a 2010 grant recipient of the Jones New York Empowerment Fund. An extreme career changer, Caroline started her career as a conservatory-trained classical pianist. She currently stays active in the arts, performing improvisational theatre and stand-up. Caroline is a graduate of Barnard College, Columbia University. University. Connie Thanasoulis-Cerrachio, career coach, writer, speaker, Gen Y expert and co-founder of SixFigureStart®, has a 25-year career with leading Fortune 500 companies including Merrill Lynch, Pfizer and Citigroup. Most recently, Connie was the Chief Operating Officer for Merrill Lynch Campus Recruiting, where she helped to streamline the campus recruiting efforts in the United States, with that of Europe and the Pacific Rim regions. Connie is a career columnist for CNBC.com, Vault.com, Wetfeet.com and Crain’s New York and teaches Professional Development at Columbia University School of International and Public Affairs. Her career advice and job market insights have been extensively quoted including mentions in ABC News.com, Crain’s NY, BusinessWeek, Forbes.com, and WNYC radio. Prior to recruiting, Connie held a variety of positions in both marketing and sales. Connie enjoys scuba diving, tennis, quilting, and having fun with her husband Ron and their dog Sophie. She also has an irrational but passionate preference of Nadal over Federer. Connie is a graduate of New York University.